recommended for: Fans of Emily Bronte (Wuthering Heights), Sharon Cameron (A Dark Unwinding), and tragic romance. This is one of those books where I thought, "Hey, that cover is pretty. And look! It's a gothic romance! Based off of Wuthering Heights! That sounds neat!" Now let me tell you, my feelings about Wuthering Heights were: I enjoyed the story immensely even though I hated most of the characters. My experience was very similar with Black Spring. I wanted to wring Lina's spoiled little neck half the time, but the story itself was quite good--and wouldn't have been the same if she'd been kind and not a horrible person. That said, I had mixed feelings. I felt that many parts of the book were too identical to Wuthering Heights to be interesting and many interesting parts of the book that were quite unlike Wuthering Heights were underdeveloped. Overall it was a clever remake with a super clever fantasy environment, but its at-times slavish mimicry of its inspiration caused an otherwise exciting reimagination to fall flat. It was like reading Wuthering Heights all over again. We begin with a totally unnecessary frame of some rich dude named Hammel journeying to the wild magical North. But wait, I thought. Maybe he'll be more integral and this won't be a perfect replication of the frame in Bronte's original. ...Or maybe it'll be exactly the same, down to the dog bite and the storm stranding Hammel with his scowly new landlord, and Hammel then seeking stories from the kindly maid. This wasn't the only passage that could have been lifted directly from WH. It was irritating and unbecoming for a writer who, by the rest of the book's standard, is clearly skilled. Because parts of the plot were exceptionally fascinating. Lina's being a witch, unaccepted in the north; the cult-like wizards; the vendetta and the blood tax--these were brilliant additions that made the story come into its own, rather than being a poor fabrication. However, all of them could have been explored much more deeply and I would have enjoyed the story more. Instead, they seemed more like trivial incidents poked into the preset plot that was little more than a WH rewrite. Croggon gets major points for concept. Her worldbuilding is exceptional and despite my beef with this book, I will read more of her work. To give you a taste, she invents a rough Northern land where wizards enforce the vendetta. Basically, if a man is killed, then the murderer is identified and a bounty is on his head. He gets forty days to set his affairs in order, then the victim's oldest male relative kills him. Then that murder has to be avenged, so the original murderer's male relative kills the other guy. And so on until the town is full of graves and widows. 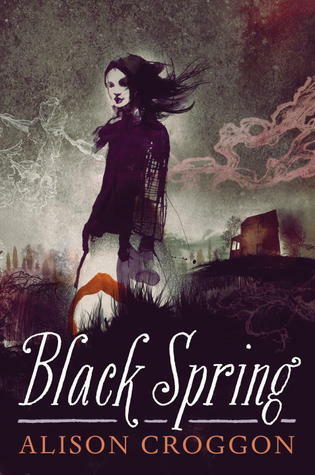 It's a fantastic concept rooted in a pseudo-religious cult and royal schemes, and it's just one of the examples of the strengths in Black Spring. What killed it was that she tried to stick too closely to Bronte, and didn't allow enough of herself to shine through. Just because I hated the characters doesn't mean they weren't good characters. Sometimes, that means that they are. Lina was a self-absorbed, borderline little psychopath but she was well written and drove the story in surprising ways. Damek could have been deeper. I didn't quite buy his love for Lina the way I did Catherine's for Heathcliff. It felt underdeveloped. That said, Anna was lovely. You get a lot of her voice and so you come to know her intimately, and I loved that. Honestly, if Hammel was gone and Anna and the effect of the vendetta on her was more of a focus, I'd have liked the story more. Hammel was pretty useless, unfortunately, and the Wizard Ezra could have had so much more screen time. With the exceptions of a few anachronisms ("fad", to name one), Croggon's Victorian style is spot on. It's not as modernized as Sharon Cameron's. Cameron keeps the flavor but sloughs off some of the more difficult diction, so it's more accessible. Croggon goes full on Victorian and the effect is gorgeous. While I can see that some younger readers could find it difficult or cumbersome, I thought it was beautiful and showed a real mastery of Victorian style. Get rid of Hammel! He served no purpose except to mimic the original, which was unnecessary anyway! A beautifully written gothic romance with fantastical elements; it takes a fine stab at retelling Bronte, but spends too much time paying homage and not enough touting its own unique qualities. "However, all of them could have been explored much more deeply and I would have enjoyed the story more." This often seems to be the problem of retellings anyway. How much of the story stays your own? How many elements of the original do you include? "Her worldbuilding is exceptional and despite my beef with this book, I will read more of her work." That's good to know. I actually have some books of hers from another series. "Sometimes, that means that they are." True. And the mark of a good writer, especially if she's created unlikable characters who still stand on their own. "With the exceptions of a few anachronisms ("fad", to name one), Croggon's Victorian style is spot on." Are you a huge fan of the Victorian period? Truthfully, no matter how many novels I've read in the Victorian period and adjusting some 20 years up and down in the nineteenth century, I don't know if I would be able to detect such slight details. I should have known there was an erotica retelling. It should be a law. "If x, then erotica x." That makes my inner reader sad. So true. It's a tricky balance. I've seen fantastic retellings though. Take Everneath by Brodi Ashton. Plays off the Persephone myth, but twists it into something that manages to stay true to the myth but also expand it into something entirely unique. Or Splintered by AG Howard, which goes into the future of Wonderland and makes it new. But Black Spring is just TOO close in too many ways. I think she shows a ton of promise as a writer. This one just didn't do it for me. She has all the pieces; they just didn't fit together in the right way. I love the sound of the world-building. It's always an important aspect in a book. I'm also a fan of Victorian writing-styles. The only thing that bothers me are the characters.. I really have to like them to enjoy a book.